We started off with great hopes of using Give a Little as a fund-raising platform. Ours is such a cool idea - people can claim a random act of kindness (RAOK), or advertising, for their donation. So far we have paid forward $14,220 worth of RAOKs! Though to date we have been unable to get our page fully moderated and hence it doesn't appear in any searches people might do to find us; and after lurking a while looking at other causes we definitely got the feeling that you had to have a sad story, be a sportsperson, or in the media to have a chance of success. We even saw people we knew. 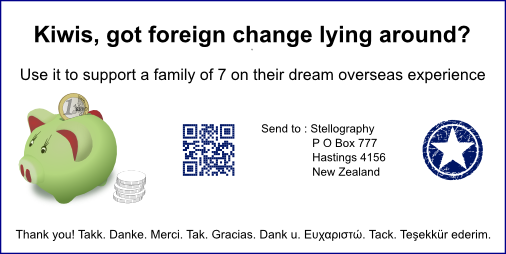 That's when we came up with the alternative idea of a foreign change fund-raiser, where people could post in any loose overseas change that might be littering their home or office. It doesn't take the NZ dollar away from the genuine needs of others; it provides folks with a chance to do a RAOK with the only cost being a stamped envelope; they get to spring clean something in their environment; and we get foreign cash without losing on fees and rates. We'd be delighted with anything we get, and doubly so that someone believed in our dreams. You'll find a social media info-card we mocked up to share the idea on our Twitter and Facebook pages; and a jar wrapper (download) for businesses to use in their staff-rooms or on their front counters. We still need to get the idea out via social media onto jars and into envelopes. So if you can tweet, post, or share in any way we'd be grateful for your random act of kindness towards us. I almost can't believe we've made the decision to go and are able to follow it through! Returning to Germany has been a dream I have held dearly for a quarter of a century. Yes, 25 years! We've got our passports; are watching Skyscanner daily; have made a short list of what we absolutely have to get done before we go; and have been earnestly finding out about what to do, what to see, and how it might all work. It's times like this you're grateful for checklists. We thought we'd ease the children into the possibility of culture shock by landing in an English-speaking country first - which may as well be England as flights are economical. Then it's off to Tuebingen (Germany) and beyond. Using the bi-lateral visa waiver agreements that New Zealand has with specific European/Schengen countries, we can stay for up to 3 months per 180 days. I wish we could secure a Residency Permit for Germany that allowed us more time and greater flexibility there but you need to have an offer of work, a study placement or a spouse/immediate family member there to re-unite with to even have a chance. Some countries accept a prescribed amount of funds as another method of longer-term entry, but that's not the case with Germany unfortunately. My focus is on making Tuebingen home so that is where I am currently trying to find accommodation and have been looking into family-friendly activities too. Housing if we are fortunate to find the right place will still be 3 - 4 times what we were paying on our mortgage and about double what we might be able to rent our home out if furnished. At the upper end of the market housing in Tuebingen is around 8 times dearer. That's hugely disproportionate before we even start to look at food, transport and activities. Do you want to go somewhere similar or different? Are you happy about coping in a place where the language / currency / customs / weather are a change from what you are used to or not? Do you want access to specific activities / events / resources? Are there images you've seen or recommendations people have given you that pique your interest? While for some there may be a 'right' or a 'wrong' answer, I would venture to suggest that any place will be a valuable experience! Take a cursory look at the country's national tourism website and media. Find the regional and local tourist information bureaux websites. Scrolling back through any social media site they have will show you what activities and events happen at the time of year you want to be there. Scout out the calendar of upcoming events too. Look at photos on Flickr or via a browser image search - this is a good way to gauge the weather. Find the local government website where an introduction to new residents to the area might be written detailing it's services; and most often there are useful street maps to download. Search ex-patriot forums & websites of people who live there for inside tips, opinions & raw observations. Remember though that you will need to filter everything through your own unique situation. After more than 2 years keeping an eye on the market it seems ever-increasingly remote that we will be travelling around New Zealand in our own mobile home (despite writing the e-book below!). We did look at rentals but didn't find one that was seat-belted and slept seven let alone capable of sustaining a freedom-camping lifestyle. The next idea was home-stays (holiday homes) which we still might be able to do, but after letting our options sit and reflecting on our situation the long-term goal of travelling to Germany/Europe came back into focus again. Over the last few years we've saved at least a third of what we've been told to budget for a year-long adventure. It's enough to get us to Germany for 3 months and back again - that's all. 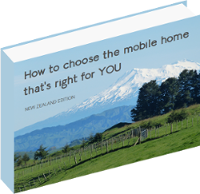 Obviously we still want to see other countries after going all that way so we are selling anything we can on Trademe, have launched our e-book and a GiveALittle campaign to bring our dreams to life. The more we raise the longer we can travel and the more experiences we can share together as a family while we are away. Here's what we are thinking about the different scenarios. Both Trademe and Gumroad (where our e-book is hosted) take a commission on sales, whereas Give a Little doesn't charge any fees for fund-raising. You've got to love them for that! What we'd like to do with Give a Little is run a Random Acts of Kindness (RAOK) fund-raiser. You know how much we love RAOKs - they were our entire focus every week last year! For your donation you can claim a RAOK for someone else get a little something in return. One other way to support us if you need to buy contact lenses, glasses, books, natural health products or anything from Cafepress is to click the link from our website, so we might receive a reward for referring you to places we use ourselves. WILL THESE FUND-RAISING IDEAS WORK? Perhaps. Maybe. We sure hope so. Printed from http://www.stellography.com/electra on 21/04/2019 - 11:02.